A KD style table on the left, and an American-made unibody table on the right. Comparing construction techniques between different tables is admittedly difficult. Some designs support the end pieces of slate directly on the legs, with the middle piece supported by the carrying beams and side length. This design requires that the side length and beams be very thick and strong. It is a very old design, dating back easily 150 years. Modern style tables normally have a hidden criss-cross base frame with sides and ends that are only decorative. In this case, the thicker the frame pieces are, the stronger they will be. A frame pre-built in the factory is normally stronger than one assembled in the house. Most antique-style tables have a slanted body that serves both as the base frame and the actual table body. The slanted sides add to the frame’s strength, just as in a bridge or truss roof design. Triangles are naturally stronger than squares. There are generally two methods of building this design table. A unibody design has the same advantages in billiard table design as in automobile design-it adds strength without adding weight. 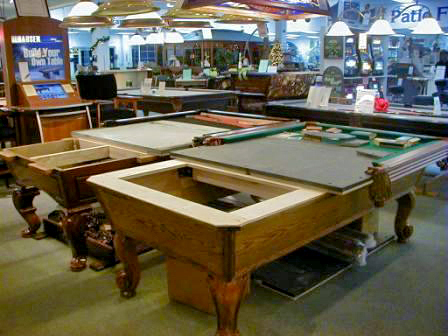 Unibody tables are pre-built in the factory all in one piece – the installer just adds the legs and does the true billiard work (cloth, pockets, slate, seams, leveling). The advantages of this construction technique are in strength and furniture. Just as in any form of furniture, an Ethan Allen bureau is going to be completely built and finished at the factory, and every part is going to fit perfectly. A Wal-Mart bureau will be less expensive – but you’ll probably assemble it yourself, and it won’t necessarily be as strong or fit together as perfectly. Why? Because the factory had jigs, tools, space and practice. If something didn’t line up, they could fix it right there. Parts can be permanently joined by glue and nails instead of nuts and bolts that can loosen over time. Unibody tables generally support the slate with a 3¾ to 6 inch wide top liner, all around the outside and across the middle of the table. This spreads the weight of the slate out over a very wide area: as much as 12 square feet! The slate in this case is not supported just by a couple of two inch beams, but by the entire structure, equally. If necessary, most unibody table frames can be taken apart in order to get them into a tight space. Generally, this means getting up a spiral staircase. Even the biggest dealer may go years before they run into an instance such as this. Why then, doesn’t every manufacturer make unibody tables? Because they are really difficult to ship long distances. Generally, manufacturers who ship mostly large orders of tables to large dealers will build unibody tables – nothing’s nothing’s going to happen to that body when it’s shipped on a full tractor-trailer. However, in order to ship only one table, they have to build a giant crate for it, and hope that it’s not damaged in shipping. Custom work is therefore much more expensive on unibody tables unless you can wait to add your order to a regular stocking truckload. The other type of slanted body table is called KD or Knocked Down. They are easier and cheaper to ship. Usually, the base frame and cross beams are all assembled by the installer in your house. Sometimes, the table comes from China to the store or the warehouse as a KD table, and gets pre-assembled there before delivery. A particle board slate pad of some sort may be added at the same time. In this form of construction, you will need much thicker and heavier side walls and end walls, plus cross braces. Often, this type of table will have an additional center brace down the middle of the table. This is because, without a strong plywood top liner, these parts are doing all the work of supporting the slate. Often, a KD table will have long or short glue blocks stapled to the top of the side wall in order to accept the slate bolts. Don’t ever pick this type of table up by the slate, even to move it just an inch. The glue blocks are fine for holding slate in place (the slate’s not going anywhere anyway), but they won’t support the weight of the table if you lift it up by them. On a KD table, it is particularly important that the cross braces and center braces be securely fastened to the side and end walls. Often, they just drop into a U-shaped wood or metal fitting (like a joist hanger) and lean against the wall. This makes the installation easier. However, downward pressure from the slate can press the braces against the slanted walls, and cause the walls to bow outward – and allow the slate to sag in the middle. How do you tell? See if the braces are notched into the walls, or perhaps bolted in. If you can wiggle it, then it’s probably not doing anything! There are two pages of regulations in the BCA rule book covering the quality of the table and equipment for a sanctioned tournament. This is what is normally meant by a “regulation” table. It has nothing to do with the table’s size. We regulate the quality of the table so that a touring professional player can expect the same quality of play in a sanctioned tournament anywhere in the world. The average player probably cannot tell the difference in playing on a slightly non-regulation table – and it is not a reasonable assumption that a table meets the regulations just because it is expensive or a major name brand. The regulations are available to check against any table’s specifications if it is important to you. Warranties might be an indication of a table’s quality, but only if you read the entire warranty, and think about it. A ten year warranty that covers parts and labor with no exceptions is actually much more valuable than a triple lifetime warranty that only gives you a discount on parts and doesn’t cover labor. In almost all billiard repairs, labor and transportation is worth more than the parts. For instance, it can take $400 in labor to replace $40 worth of cushions. Look for clear, simple statements, with a minimum of exceptions. Do not buy a table without reading the warranty first – after it’s installed, it’s too late. If the warranty requires you to register it right away, do it by registered mail. Don’t lose your entire warranty because you can’t prove you mailed in the registration when you bought it. Any warranty, by the way, would probably want a copy of your receipt. Keep a copy taped to the underside of your table, where you can easily find it if you need it.